Northeast winds over much of the Upper Midwest kept birds down once again. 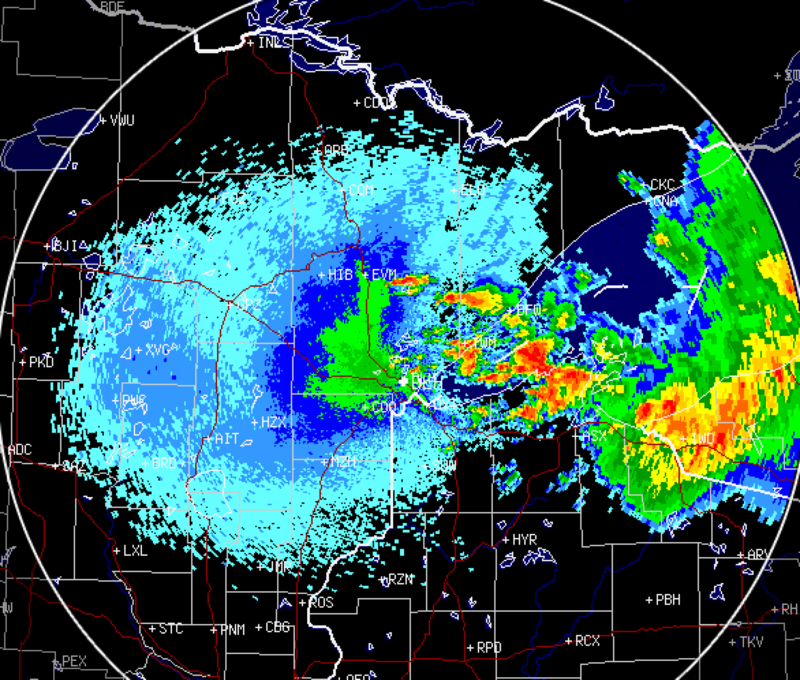 Little-to-no migration evident over either Duluth or the Twin Cities radar stations. Expect birding conditions to be consistent from yesterday. A cold front draped across the country from Nevada to the Ottawa, Canada marked the southern boundary of moderate to heavy migration down into the midsection of the U.S. this morning. High pressure over the Southeastern U.S. also allowed birds to move south but migration densities were much more diffuse. Migration was also evident across the western U.S. all the way to the Pacific Coast. Birders along the aforementioned front this morning should be on the lookout for high densities of birds locally. Right now my computer is on the fritz, showing it’s age and having a really hard time handling the radar processing and timely posting. Until I can get a new one, I’m going to have to scale back posting the radar. I’m sorry for any inconvenience. Conditions across the U.S. continue to favor nocturnal migration in all but a few locales. A frontal system draped across the Atlantic did cut off Peninsular Florida from the bulk of incoming migrants, but otherwise birds were moving in moderate to high densities from New England to Texas, and from Arizona to the Pacific Northwest. The Upper Midwest and Appalachian regions appeared to have the highest densities of migrants moving last night. Winds over Minnesota were light to moderate northwesterly at altitude above Duluth, fading to light and variable over the Twin Cities. On the surface winds were even less significant (< 5 kt) and north/northwest. This triggered another big night of migration into the Duluth/Superior region while migration over the Twin Cities was only light to moderate and very diffuse. It appears that the next big wave of migrants (most likely the most diverse in terms of Neotropical warblers) made it into the northern reaches but not all the way down into the central part of the state. It will be interesting to see whether this is reflected on the ground this morning. As above, migration into Wisconsin was higher to the north and got more and more diffuse as birds moved south through the state. Expect birds to be dispersed across the state this morning with higher concentrations at the more consistent fall hotspot locations (such as Pheasant Branch in Middleton, or some of the lakeside patches around Milwaukee). Again, migration was lighter last night than in previous nights suggesting that keeping the migration doors open has thinned out the population of migration-ready birds across the region. Northwest winds do appear to have pushed birds into the Chicago area suggesting that birding conditions at inland and coastal hotspots should be decent this morning. Widespread migration continues across U.S.
As the latest cold front marches across the U.S., birds took to the sky once more last night. My computer is on its last legs and is taking forever to download and process the data, so I’m very short on time this morning. Here’s the radar for your interpretation!